At the Red Cross, we offer AED training in Annapolis in three convenient ways: online, in person and via our blended Simulation Learning experience which combines online coursework with an in-person skills session. This way, you can learn in the way that suits your lifestyle and your learning style best – and gain the skills you need to help during times of crisis. Note: Only in-person and blended Simulation Learning courses result in full OSHA-compliant certification. AED classes in Annapolis can give you the knowledge and confidence to help someone in a time of crisis. Delivered in a traditional classroom setting, with lecture and hands-on skills training, our AED courses allow you to become familiar with the technology, ask questions, and learn in a supportive environment. 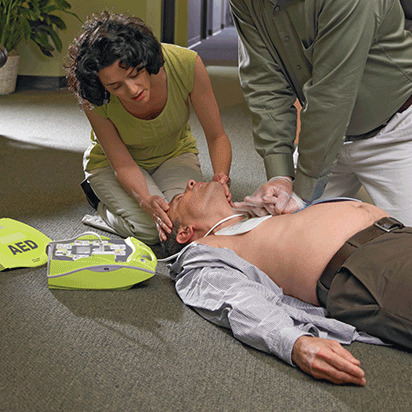 At the Red Cross, you can get AED training in Annapolis without ever leaving home. With our online-only courses, you can learn how and when to use an automated external defibrillator, and help provide critical care during times of need. Our online-only classes deliver the same information as our in-person and blended learning courses, but in lieu of a hands-on skills session, you'll perform a range of online activities that will help you gain a deeper understanding of the material. After completing one of our AED classes in Annapolis, you'll be able to capably, confidently, provide care to someone during a sudden cardiac arrest. In order to administer a "shock" with an AED, you'll open the person's shirt, wipe his or her chest, apply the AED pads and follow instructions from the device. Afterward, you'll begin CPR, if necessary. Because of the last step involved, our AED classes include a segment that will allow you to also earn your CPR certification. If you don't often use the skills you've learned in our AED classes in Annapolis, it's easy to forget how and when to use an automated external defibrillator. In order to keep your memory fresh, we've created a printable document that outlines the steps necessary for providing life-saving care. This way, you can keep the instructions in a binder, on your refrigerator, at your desk or in your bag, and refer to them from time to time so that you're ready to help when it's needed most. We offer AED training in Annapolis for students and administrators. Through our special schools program, your faculty and students can learn how to properly use an AED, and be ready to help when every moment counts. School courses result in full two-year certification, and all participants will have access to our online refresher materials, which can help keep their skills sharp long after their AED training has ended. After successfully completing your Red Cross AED training in Annapolis, you'll receive a certificate that's valid for two years, as well as online access to a wide range of refresher materials, including videos, activities, tutorials and more. This way, you can easily maintain your skills throughout the certification period. If you need to need to share your credentials with an employer, potential employer, or volunteer organization, all of your Red Cross certificates are available digitally, and come with unique ID and QR codes make the process simple.